Guyana’s natural ecosystem consists of eighty percent rainforest and expanses of untouched neotropical forests with different species of plants found nowhere else on earth. For example, curare is a paralytic, plant-derived poison used in fishing and hunting in Guyana, while it may also be used in modern medicine as a muscle relaxant, and as an adjunct to anesthesia in heart surgery. Leaves of Life: Volume1, Single Plants reveals the secrets of Guyana’s biodiversity and tropical vegetation. These secrets were traditionally confined to the “Bush Men” and women who were the keepers of this knowledge and the individuals who made their living cultivating plants. 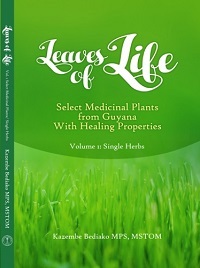 In Leaves of Life: Volume1, Single Plants, the author of the Behutet series and native of Guyana, suggests that the medicinal uses of plants are becoming more popular in contemporary life and that there is an herbal remedy for any ailment. Scientists recognize the infinite potential of rainforest vegetation to prevent, treat or cure ailments and diseases that plague modern life, such as AIDS, Alzheimer’s, arthritis, cancers, diabetes, heart problems, infertility, leukemia, multiple sclerosis venereal diseases, and more. Leaves of Life is a priceless resource of information on over one hundred single plants, believed to have been lost over generations. With this reference manual of plants from Guyana, organized into diagnostic categories, you can use this information to improve the quality of your life and to spread the knowledge of the medicinal and healing properties of single plants.